In the fragmented coatings industry, Assovernici’s «Colore Sicuro» project has been created to promote the excellent member manufacturers, who share and support mutual values inspired by respect for their customers, for their products, society and the environment. HEALTH AND SAFETY — Acting responsibly to protect the health and safety of workers at production sites, of users and their customers. ENVIRONMENT — Favouring the cleanest technologies and eco-sustainable products with a special focus on energy saving. TRANSPARENCY — Easy access to all information on the member companies, their products and services. SOCIETY — Contributing to technological progress by operating as players involved in a social, economic and cultural context. INFORMATION — Spreading knowledge of products by helping consumers to choose the most suitable products for their needs, using clear and authentic communication. 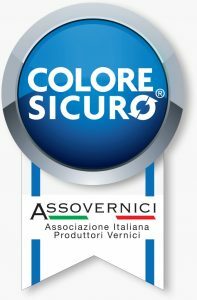 Arsonsisi has joined Assovernici’s «Colore Sicuro» project with its complete range of industrial coatings.